Now Apple has used up all the good big cat names, what next? After Snow Leopard, what next? 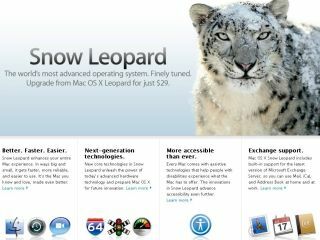 For all its joys, the release of Snow Leopard is a worrying milestone for Apple: it's pretty much used up all the big cat names, and the only two biggies remaining - both of which Apple had trademarked for a while - are Lynx and Cougar. That's bad news, because neither name boasts particularly positive associations. Fancy a copy of OS X Scent of Spotty Virgins, or OS X Sexually Rapacious Older Woman? Mind you, even if Apple were to call its next version of OS X Fat Tabby, it'd be a damn sight better than some of the names out there. Whose bright idea was it to call the Linux image manipulation app The GIMP and make us think of that bit in Pulp Fiction, or to call a music service Fairtilizer.com - or to create a social media aggregator and give it the sniggering monicker Profilactic.com? We're not big fans of GNOME, either: it's an acronym of something that includes an acronym, GNU Network Object Model Environment - and GNU itself is a recursive acronym for GNU's Not Unix. How very clever. At least the chaps and chapesses at Ubuntu are having harmless fun with their codenames: Jaunty Jackalope, Warty Warthog, Hoary Hedgehog, Breezy Badger, Dapper Drake, Spunky Squirrel, Edgy Eft, Feisty Fawn, Gutsy Gibbon, Hardy Heron, Intrepid Ibex and Karmic Koala. We only made one of those up. Other people's product names, however, just boggle the mind. A search engine called Wotif.com? A database called Freebase that shares its name with a potentially lethal way of getting high? The Sci-Fi channel's rebranding to SyFy - and worse, its plan to offer Wy-Fy from SyFy? And we haven't even started on Web 2.0's worst excesses, where people seem to think it's a really good idea to build something called Oooooc.com. Worst of all, inevitably, is Twitter. Twibbon makes us furious for no good reason and so does DestroyTwitter - not because it's a bad name per se, but because it promises to do something wonderful and turns out to be nothing more than a decent Twitter client. Something called DestroyTwitter should destroy Twitter, dammit! Just when you think you've scraped the very bottom of the Twitter barrel, however, something even worse turns up. Ladies and gentlemen, we bring you Spaz. That's right. Spaz. "We've also been contacted by many users in the UK and surrounding regions who have indicated that they don't consider the term offensive at all," the developers write. "So at worst, it seems like a limited issue for some folks in one region of the world." We can't wait to see what they call their follow-up apps.